What was the inspiration for one of the greatest plays ever written? The original new musical Swagger, created by Mark Evan Chimsky and Zev Burrows, is a story of passion, political intrigue, and prejudice that reveals what caused Shakespeare to break the rules – in his life and art – as he created Hamlet in 1600. After years of not allowing himself to grieve the death of Hamnet, his eleven-year-old son, Will finally opens himself to the pain of loss when he learns his beloved father is dying. He stops writing and is only brought back to life by the arrival of a mysterious ambassador from Morocco, Abdul Guahid, one of the first Muslims ever invited to meet Queen Elizabeth I. The forbidden attraction between Will and Abdul leads to great danger for both men, but in the process they learn to find love – and themselves. Set against the politics of Queen Elizabeth’s court and the hardscrabble ambition of Shakespeare’s company of players, Swagger is a timely musical that explores the xenophobia that seized Elizabethan England and how love can inspire genius to create something daring and new. The musical is both a provocative look at a hidden chapter in history and a love letter to the transformative magic of theater. Talk about an amazing experience! Zev Burrows and I were excited to be invited to audit this year’s ASCAP Foundation Musical Theatre Workshop in LA on February 7 and 8. It was thrilling to be there, with so many who are devoted to writing and developing new works of musical theater. Stephen Schwartz (Wicked, Pippin, and Godspell), along with his distinguished panelists Karey Kirkpatrick (Something Rotten), Dean Pitchford (Fame and Footloose), Kevin Bannerman (Forever Plaid), and Stephen Bray (The Color Purple) provided wonderfully insightful critiques of excerpts of the two new musicals presented, The Bully Problem by Michael Gordon Shapiro and Tenn by Julian Hornik. 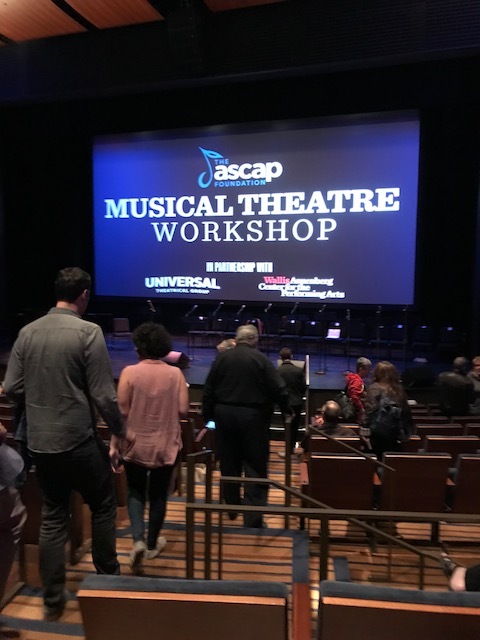 On February 9, Schwartz was joined by successful musical theater artists Cinco Paul (Bubble Boy and the Despicable Me series) and Zina Goldrich and Marcy Heisler (Junie B. Jones and Ever After), whose musicals had been critiqued at the ASCAP workshop in the past. Their songs were performed by such talented special guests as Megan Hilty, Ciara Renee, Jonah Platt, and others. We learned of Schwartz’s generosity in nurturing many musical theater artists over the years. His dedication was evident in his feedback and willingness to share his wisdom with us. It was as if he and his colleagues packed a year-long musical theater master class into three days. Zev and I are grateful we could be there for this incredible workshop! 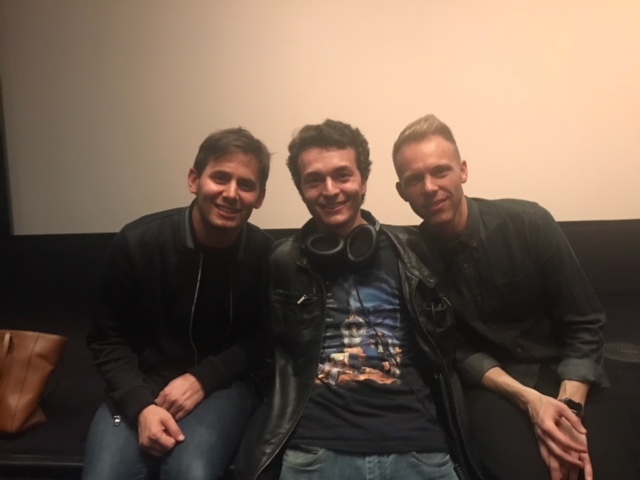 Swagger composer Zev Burrows (center) had the opportunity to meet two of my musical theater heroes Benj Pasek (left) and Justin Paul (right), who created the songs for Dear Evan Hansen, at a special screening of their movie musical The Greatest Showman in New York City. Yay, Zev!